Reading progress update: I've read 92 out of 352 pages. I'm putting this one on hold, actually, it's been on hold. I am having difficulty connecting to any of the characters and story lines. (All story lines are at a different time periods). I really thought I would like this book. 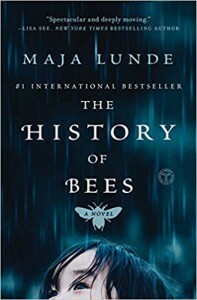 The story line follows bees, from farmers who built beehives and depended on bees, to people who hand pollinated flowers and more to ensure they bloomed and produced food since bees were extinct. I'm big on gardening, so i do love my bees and other pollinators flying around my yard. So I don't think it's the story itself. It is translated, but it seems to be a decent translation. But, the going back and forth between time frames and characters seems to be bothering me. Each section is short, but there's like 5 time frames the author is switching to and from. Kind of difficult to get to know the characters and follow each story line.